We usually rely on those responsible for organizational efforts to report the status of those efforts. Whether the reports are special or routine, the potential for conflict of interest is clear: the reporter-manager has incentives to report or emphasize good news, and incentives to withhold or soften bad news. 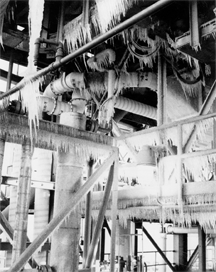 Ice on the launch pad on January 28, 1986, the day of the last Challenger Launch (STS-51-L). The unusually cold weather was well beyond the tolerances for which the rubber seals of the solid rocket boosters were approved, and it most likely caused the O-ring failure. In meetings on the night before the launch, Morton Thiokol engineers and engineering managers confronted the problem. One of the candidate solutions was to recommend that the launch be scrubbed. Another was to recommend launch despite the weather. Lower level engineers and their managers could not come to an agreement, and in the end, in an example of "covering conflict," the lower level engineers were overruled. See Howard S. Schwartz, Narcissistic Process and Corporate Decay, New York University Press, 1992. (Order from Amazon.com) Photo by Michael Hahn, courtesy U.S. National Aeronautics and Space Administration. The difficulties directly created by this conflict of interest are compounded by time skews between the choices and consequences for the reporter-managers. The incentives and disincentives relative to reporting tend to arrive very soon, even when the successes and failures arrive much later. This increases the temptation to shade reports, because the reporter-managers can convince themselves that the problems will be solved over time. Sadly, things often get worse, because the forces that created the problems usually remain in place. Inaccurate reporting isn't always the result of malice. Here are some of the sources of conflict of interest in reporting. Most of those we hold responsible for organizational efforts aren't actually in control of those efforts. Typically, they're managers, and the people who do the actual work also affect the outcome. Those who do the actual work might or might not be subordinate to the reporter-manager. When they aren't, the reporter-manager's influence on them might be diminished. It's common to interpret conflict between team members, or between the reporter-manager and team members, as a leadership failure by the reporter-manager. When the reporter-manager cannot convince a team to take a position favored by higher authority, there is a temptation to make a so-called executive decision, overruling the team, and report upward that all is well. The people who do the actual work might have external obligations of unscheduled nature. Family situations arise, or mandated training occurs, or other competitive activities appear. When the cause of a delay is beyond the control of the reporter-manager, acknowledging the situation entails acknowledging limits to one's power. Reporter-managers therefore have an incentive to conceal or under-report such delays. control of those effortsunknown nature of the task suddenly creates problems, the reporter-manager has an incentive not to report them, because to do so is to acknowledge an imperfect ability to predict the unknown. Special problems arise when the reporter-manager or the report recipient is the champion of the effort. Bad news can reflect not only on the management and leadership skills of the reporter-manager, but also on the validity of the idea itself. Bad news can threaten the champion's career; good news can create career opportunities. If the recipient of the report is also the supervisor of the reporter-manager, this effect is intensified by the career ambitions of the reporter-manager. Would you like to see your comments posted here? rbrenMEhCLypHiEwwuobZner@ChacOyzCRKeuycPoDtvPoCanyon.comSend me your comments by email, or by Web form. I offer email and telephone coaching at both corporate and individual rates. Contact Rick for details at rbrenuUvXJXiRUnYTVuJZner@ChachSBQTNJVwgKfQtkHoCanyon.com or (650) 787-6475, or toll-free in the continental US at (866) 378-5470.